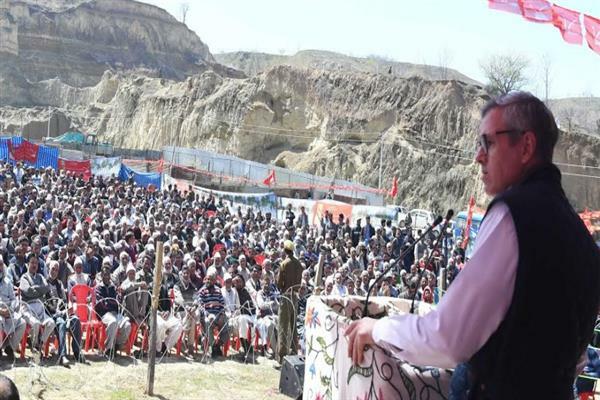 Srinagar: Jammu and Kashmir National Conference Vice President Omar Abdullah said that the BJP-RSS and its cronies in the state are trying their level best to destroy the special status of our state. Omar Abdullah said that ours coveted demand of restoring autonomy was attested to by the country’s senior leader and former prime minister P V Narsima Rao on the floor of Parliament wherein he had emphatically affirmed to grant Autonomy to the state. Omar said that he will not allow the forces as are inimical to state’s integrity and unique status to succeed in their nefarious designs to destroy the special status of the state. Omar Abdullah reiterated that if the party comes to power with a strong mandate SRO-202 and PSA will go. Party provincial president Nasir Aslam Wani also addressed people on the occasion and impressed upon people to send Dr. Farooq Abdullah to parliament with a resounding victory margin. Among others party candidate Mohammad Akbar Lone and party Reyaz Bedar also addressed the gathering.